With a giant "People of Earth!" The Cluetrain Manifesto roared into the Web’s consciousness in 1999. Appearing first as a website, quickly followed by the book, the Manifesto proclaimed an "end of business as usual." The authors, four Internet experts, led readers through the new reality of the networked marketplace with their 95 Theses, including the first one—startling in its simplicity and truth: "Markets are conversations." And business listened. But ten years after Cluetrain's original publication, too many companies are still ignoring the idea that their markets are really made up of people—and the book's message remains more relevant than ever. Companies may be wired for business, but they still struggle with how to talk to their customers like human beings. This Tenth Anniversary Edition has a new introduction and chapters in which the authors chew over the book's reception and the future of Cluetrain. The book ends with commentary by Jake McKee on marketing, J.P. Rangaswami on enterprise, and Dan Gillmor on media. 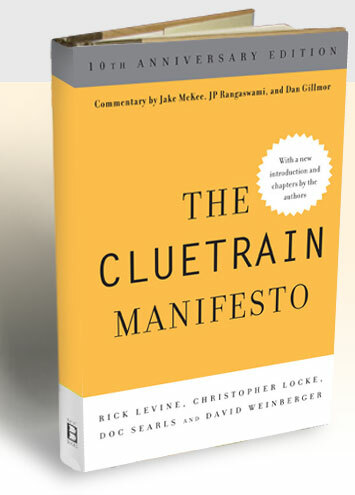 The Cluetrain Manifesto remains essential reading for anybody interested in the Internet and e-commerce, and especially vital for businesses confronting the evolving landscape of the digital marketplace. Rick Levine is the founder of Seth Ellis Chocolatier. In a previous career, he spent too much time playing with software at high-tech companies, including a stint as Web Architect for Sun Microsystems' Java Software group. Christopher Locke blogs Mystic Bourgeoisie and Entropy Gradient Reversals from his home in Boulder, Colorado. Doc Searls is Senior Editor of Linux Journal, head of ProjectVRM at Harvard's Berkman Center, and a well-known blogger. David Weinberger is the author of Small Pieces Loosely Joined and Everything is Miscellaneous, and is a fellow at Harvard's Berkman Center for Internet & Society.